You are here: Home / Great Deals / Christmas Deals / MUK LUKS Women’s Cheryl Boots Just $17.88! Down From $65! MUK LUKS Women’s Cheryl Boots Just $17.88! Down From $65! 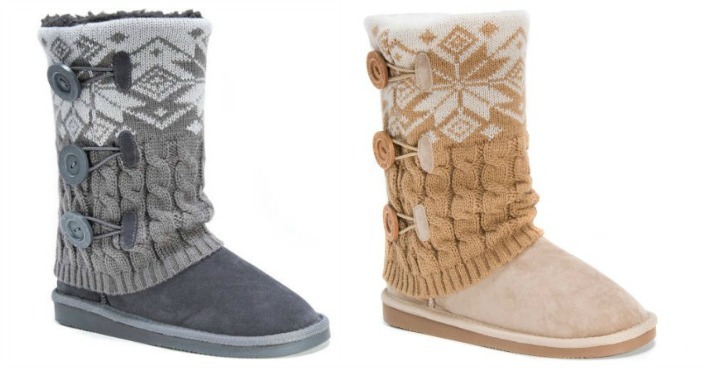 Right now you can get these MUK LUKS Women’s Cheryl Boots for just $17.88 (Reg. $65) at Walmart! Bundle your feet in these stylish Cheryl Boots from Muk LUKS. The knitted sweater overlay design is not only trendy but provides an extra layer of warmth. The Cheryl boot has an outdoor water resistant durable sole to keep your feet dry on wet rainy days and a soft faux fur inner to keep your feet nice and cozy. The pull-on style is easy and convenient, perfect for the women on the go. Pair with your favorite jeans or thick ponte pants and loose sweater for a cozy and comfortable look. Available in assorted colors.